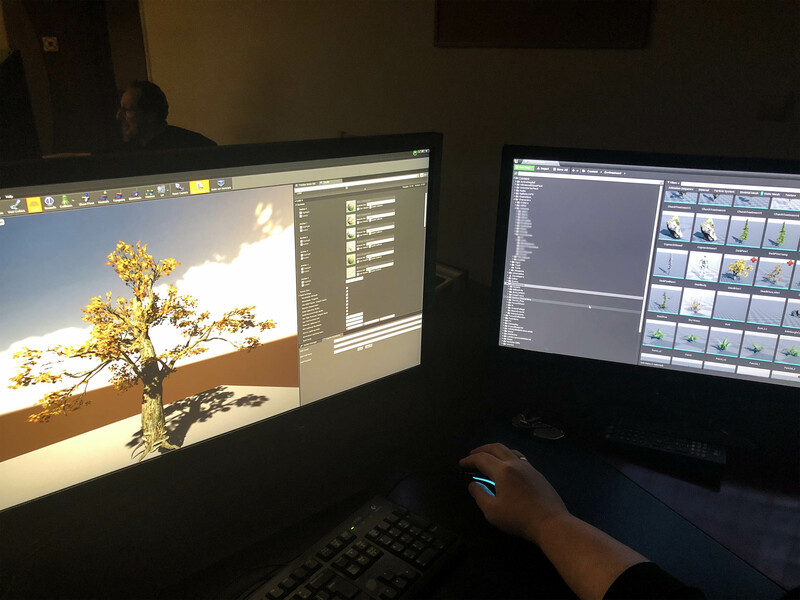 The Witchfire development diary we’re running here usually focuses on the design (like how we work on weapons or what’s our approach to story-telling), but today’s entry is a literal dear diary entry. We’ll be doing these once in a while, probably monthly, and soon the photos will be accompanied by videos. 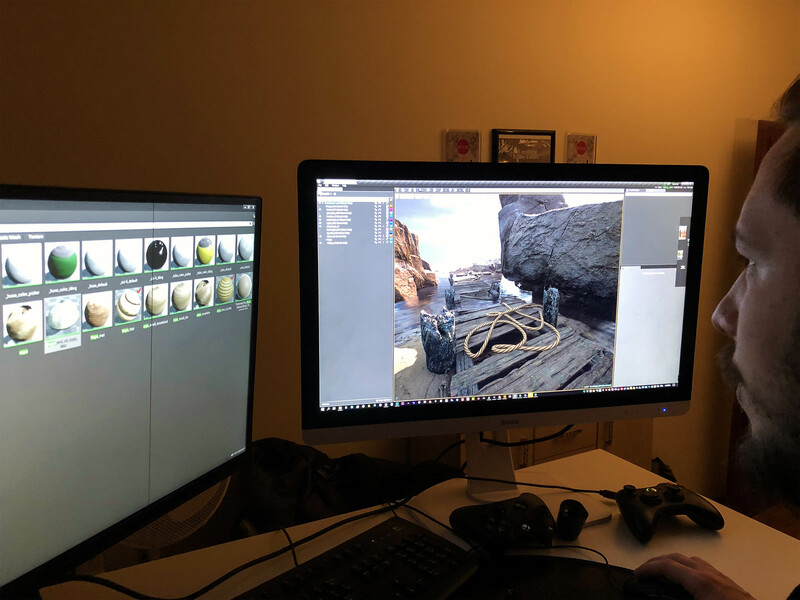 For now, it’s just a couple of snapshots taken with my phone, but hopefully the images are clear enough to see exactly what we’re working on at the moment. Adam is meshing the shore. Left screen: assets and materials. Right screen: real time preview of the results. You might have missed: that weird black line on the left screen is not a software thing, but a mysterious hardware failure. 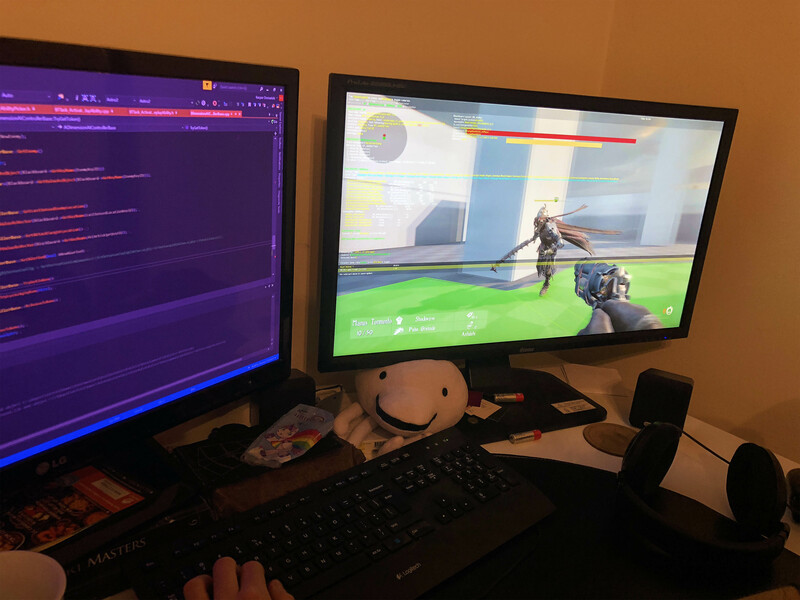 We suspect that a window frame hit the monitor during a windy day, and many pixels lost their life that day. Kamil is meshing …a place that shall remain unnamed for now. Left screen: placing a coffin. Gotta have coffins in a dark fantasy game. Especially when the story not only justifies that, but actually requires it. 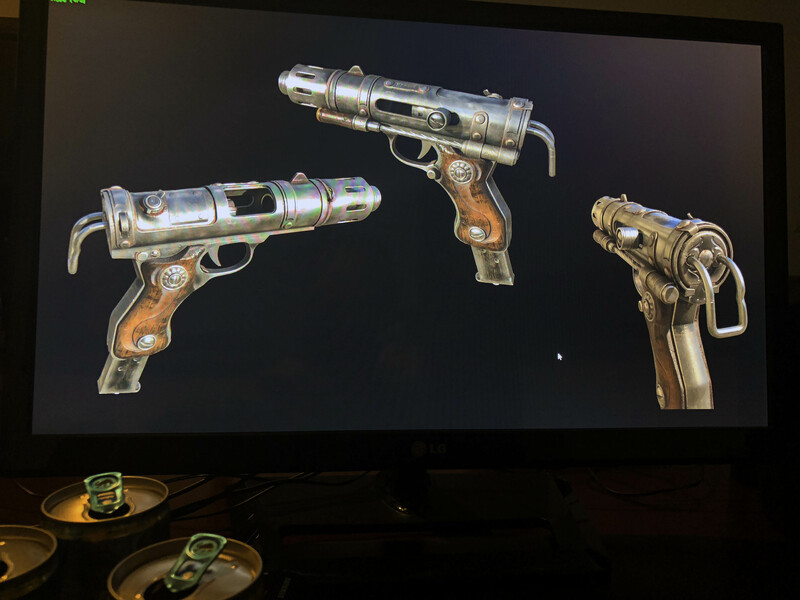 Right: the preview of the asset. You might have missed: these chains are not just for show. 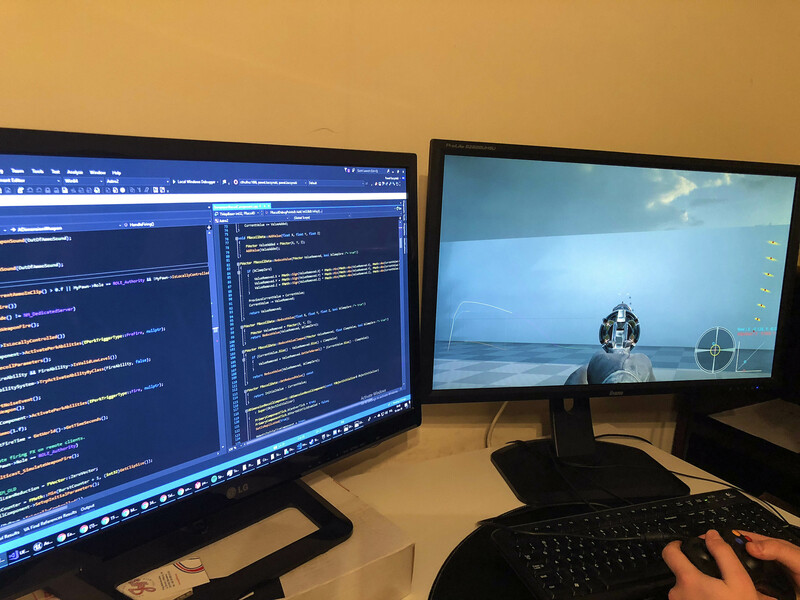 Kacper is working on the AI. Left: wizardry. 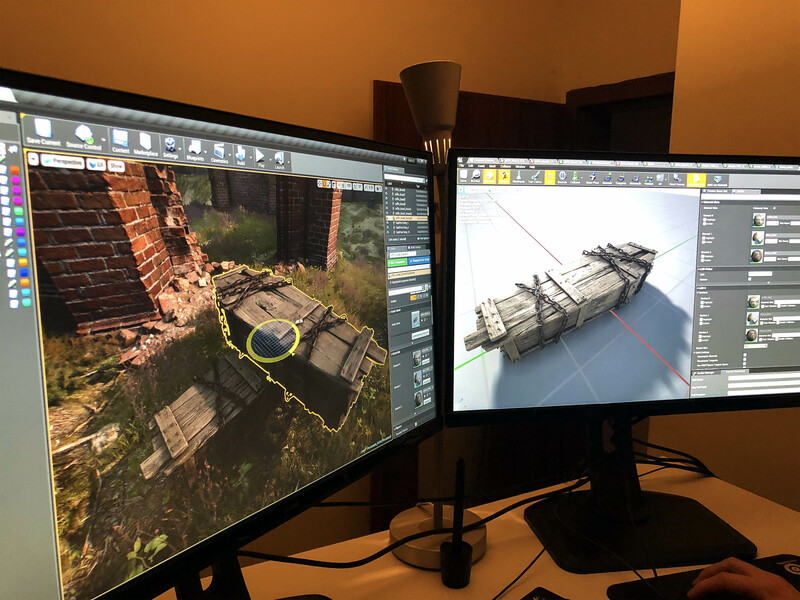 Right: the green thing is a fragment of the path-corridor, we’ll talk AI and how it all works in one of the future posts. You might have missed: well, hopefully you did miss it, but if not, let’s make it clear that the UI you’re seeing is just for our internal use. Karol is scripting a battle. We don’t control the flow of the battle, that’s for the player, but we do need to trigger it somehow. Left: the battlefield and navigation nodes. Right: an enemy you haven’t seen yet. You might have missed: that chocolate. Paweł continues the work on perfecting the gunplay. Left: blasphemy, black magic and impending Satanic Apocalypse. Right: testing the gun. You might have missed: the recoil pattern with deviations, the right edge of the right screen. 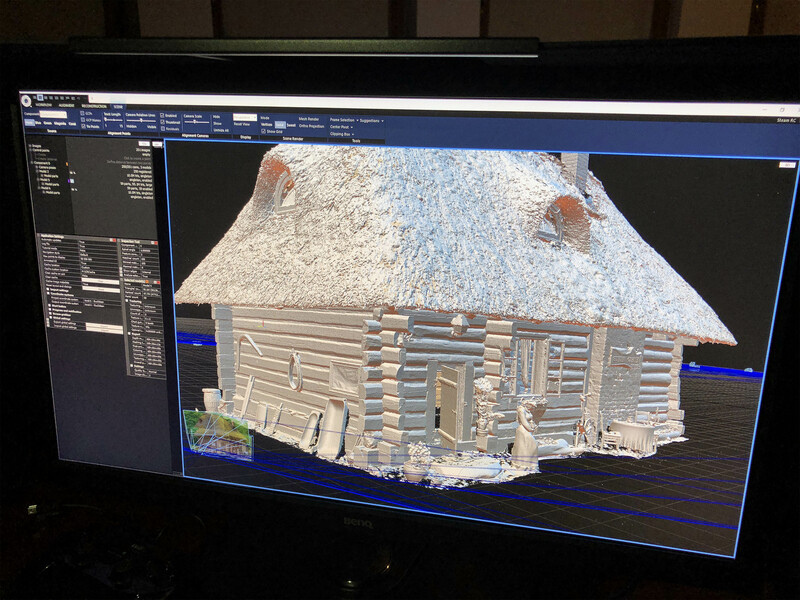 Andrew is working on a photogrammetric hut asset. So there may or may not be a village in the game. You might have missed: the name of the software we’re using. The “RC” in the top right corner is a short for “Reality Capture”. 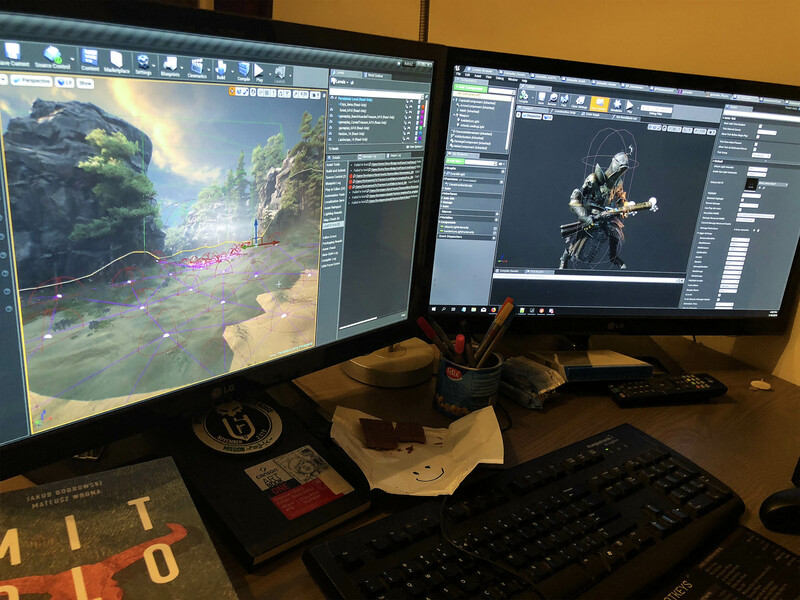 Michał was responsible for most of the vegetation in The Vanishing of Ethan Carter, and he’s still working on some of it in Witchfire. Left: a tree. Right: other vegetation assets. You might have missed: nah, Andrew is hard to miss in this photo. Me – I’m reviewing the new gun from Marek. I’d also like to show you new animations from Tamara, but that’s hard to sell with a photo! You might have missed: these are Red Bulls, in case you wonder. One is not enough. Anyway, many of you ask us about the console version of the game. Usually, developers try to avoid answering questions like that. We say “It’s possible”, then we see “Console version confirmed” in the news. We say “We’re considering a [console name] version”, and it never happens, we get tons of angry “But you promised!” e-mails. You get the drift. But not to leave the issue ignored, well, as you know we published Ethan Carter first, then on PS4, then on Xbox One. And that might not be the end. So we’re no strangers to consoles. What exactly will be the path for Witchfire, we have no idea. It’s not a dodge. We have genuinely not decided how to go about it all yet. 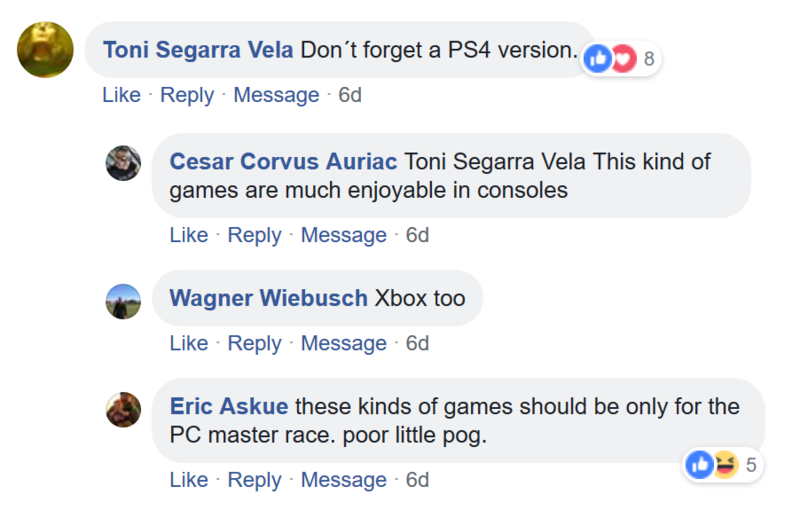 I mean, not releasing this game on a console or consoles would be idiotic (it’s UE4, which is a multi-platform engine, we’re supporting gamepads on PC from the start, etc. ), so it should happen eventually. But when, how, what platforms exactly – we’re not bothering with that yet. We still have a lot of time to decide, and every scenario is possible. I know, that was not helpful at all, but we really don’t have any concrete plans at the moment!